click photo to enlarge While on vacation we spent a couple days in the Bakersfield area. 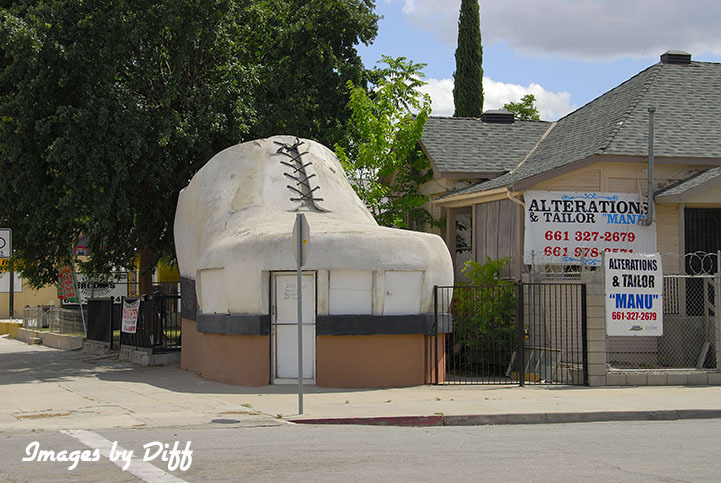 Huell Howser has a travel show on PBS in California and we had seen a number of things in the area we wanted to see / experience. They have a large Basque population and a number of Basque restaurants so we had to try one and so we ate at Chalet Basque Restaurant. It was really very good. 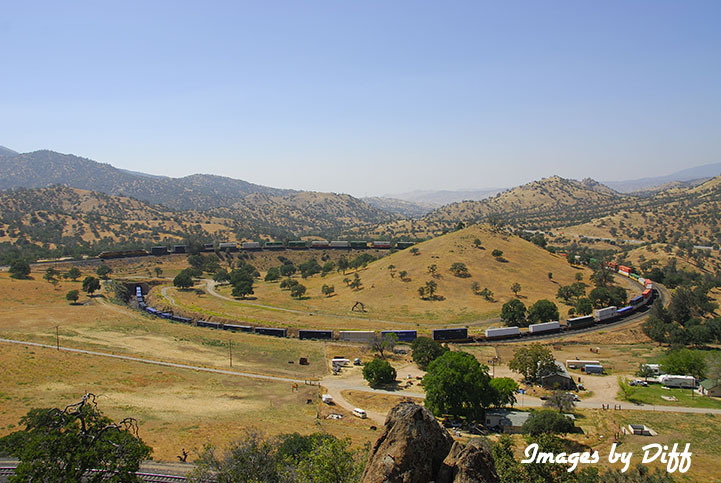 click photo to enlarge Then of course we had to stop at the world famous Tehachapi Loop. 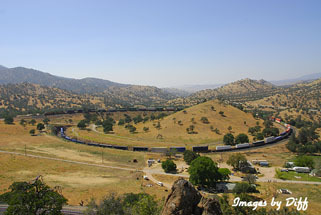 It is a 3/4 mile loop where the train actually passed over itself. Built in 1876 it was considered and engineering marvel at the time. 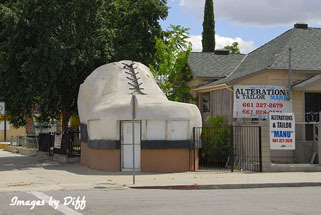 The Big Shoe in Bakersfield was built in 1947 as a show repair shop and still operates that way today. We went up to Lake Isabella and while that ate lunch along the Kern River. 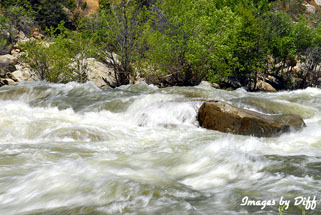 It was really flowing strong due to the record setting snow fall on the Sierras. 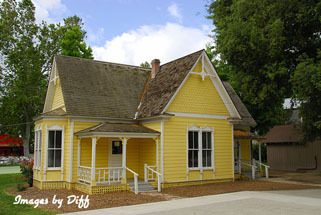 click photo to enlarge If you visit Bakersfield you must go to the Kern County Museum. It is on 16 acres and the Pioneer Village has over 50 historic buildings. We also wanted to visit Buck Owens Crystal Palace and listen to "The Bakersfield Sound". 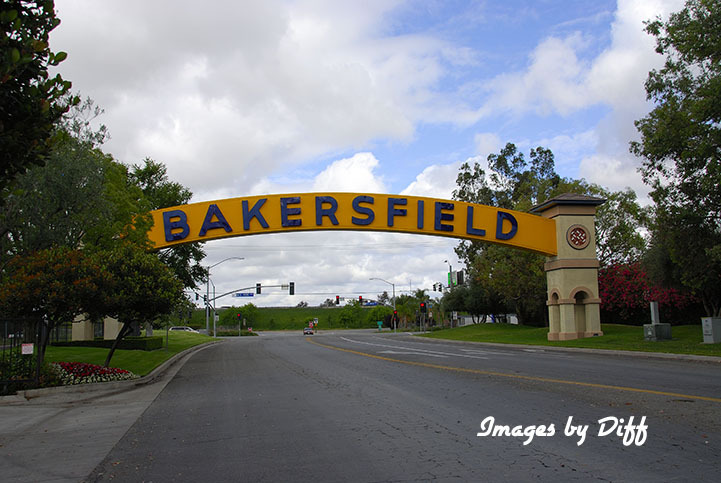 It is a genre of sound developed in and around the Bakersfield area in the late 1950s. Bakersfield has a large population of Okies who settled there during the dust bowl and they brought with them their music. It was a slightly different version of country music. In the early 1960s, Merle Haggard and Buck Owens and the Buckaroos, among others, brought the Bakersfield sound to mainstream audiences, and it soon became one of the most popular kinds of country music, also influencing later country stars such as Dwight Yoakam, Marty Stuart, The Mavericks, and The Derailers.